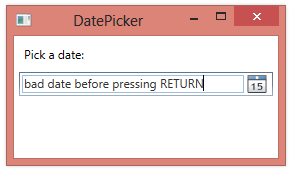 When a user manually enters a date into a DatePicker, the DatePicker control automatically checks to see whether what they entered is a valid date. 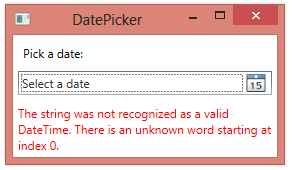 If the date is valid, it’s converted to the proper display format and the DatePicker’s SelectedDate property is set. If the date is not valid, the DatePicker by automatically reverts to the last valid string contained in this field, or to an empty string. You can react to the user entering an invalid date by handling the DateValidationError event.